8 Bollywood On Set Injuries That Shocked the Fans! Film-making is not an easy task. Action sequences of movies are filmed while taking utmost care for the safety of the actors performing it. But, sometimes things go out of control and accidents and injuries happen. This energy bar personified actor fell off the horse while shooting for the period film Bajirao Mastani. He had to undergo a shoulder surgery. And of course he did what no one expected him to do - Live tweet the Surgery!! In her five year long career, this dimpled beauty has suffered various injuries. From fractured leg to suffering burns from on-stage accident, she braved it all and didn't let anything come between her work. She even promoted her movie Humpty Sharma ki Dulhania while on crutches. Akshay didn't get the title 'Khiladi' just like that. He has proved himself worthy of this title time and again, and unfortunately in this process he also had to face many challenges and go though several burns and bruises. While performing a fire stunt for the movie 'Singh is Bling' Akshay injured himself. 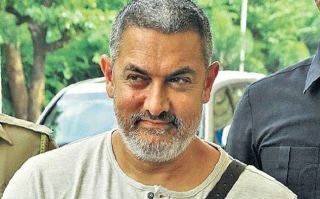 Mr. Perfectionist suffered a shoulder injury while shooting for the movie Dangal. After performing a long, high intensity action sequence that required multiple takes from different angles the actor experienced an excruciating pain. He later on tweeted and helped his fans come out of the tizzy. Nobody can forget the panic our nation went through when the infamous incident of Amitabh Bachchan's on set accident happened. It made the country standstill and pray unanimously for the actor's recovery. 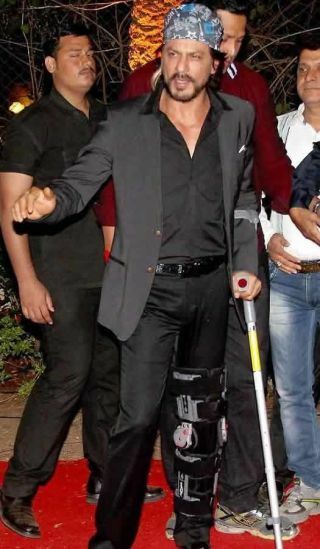 SRK's tweet is a result of a cumulative long list of on-set injuries. His has gone through a couple of surgeries for his left shoulder and left knee. It isn't easy being Dhoni for even MS Dhoni, and then to think that SSR had to perfect the famous helicopter shot - trouble, indeed. After practicing the shot he experienced some pain. Sushant had injured his ribs and was advised to take rest for two weeks.